An overview to the enhanced AAI theory version 2 you can find here. In this post we talk about the special topic how to generate an actor story. Until now it has been described which final format an actor story (AS) should have. Three different modes (textual, pictorial, mathematical) have been distinguished. The epistemology of these expressions has been outlined to shed some light on the underlying cognitive processes enabling such a story. Now I describe a possible process which has the capacity to generate an AS. As the introductory figure shows it is assumed here that there is a collection of citizens and experts which offer their individual knowledge, experiences, and skills to ‘put them on the table’ challenged by a given problem P.
This knowledge is in the beginning not structured. The first step in the direction of an AS is to analyze the different contributions in a way which shows distinguishable elements with properties and relations. Such a set of first ‘objects’ and ‘relations’ characterizes a set of facts which define a ‘situation’ or a ‘state’ as a collection of ‘facts’. Such a situation/ state can also be understood as a first simple ‘model‘ as response to a given problem. A model is as such ‘static‘; it describes what ‘is’ at a certain point of ‘time’. In a next step the group has to identify possible ‘changes‘ which can be associated with t least one fact. There can be many possible changes which can need different durations to come into effect. Furthermore they can be ‘alternatively’ or in ‘parallel’. Combining a situation (model) with possible changes allows the application of the actual situation which generates a — or many — ‘successors’ to the actual situation. A process starts which we call usually ‘simulation‘. 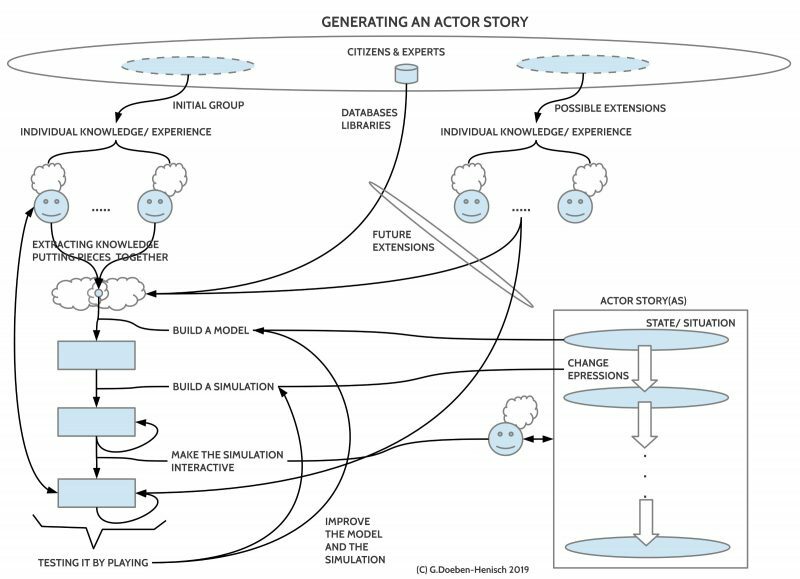 If one allows the interaction between real actors with the simulation by mapping a real actor to one of the actors ‘inside the simulation’ one is turning the simulation into an ‘interactive simulation‘ which represents basically a ‘computer game‘ (short: ‘egame‘). One can use interactive simulations e.g. to (i) learn about the dynamics of a model, to (ii) test the assumptions of a model, to (iii) test the knowledge and skills of the real actors. Making new experiences with a (interactive) simulation allows a continuous improvement of the model and its change rules. Additionally one can include more citizens and experts into this process, using available knowledge from databases and libraries etc.